Definition at line 2730 of file DeclTemplate.h. Definition at line 2853 of file DeclTemplate.h. Definition at line 2855 of file DeclTemplate.h. Definition at line 1132 of file DeclTemplate.cpp. Definition at line 1150 of file DeclTemplate.cpp. Retrieve the member variable template partial specialization from which this particular variable template partial specialization was instantiated. 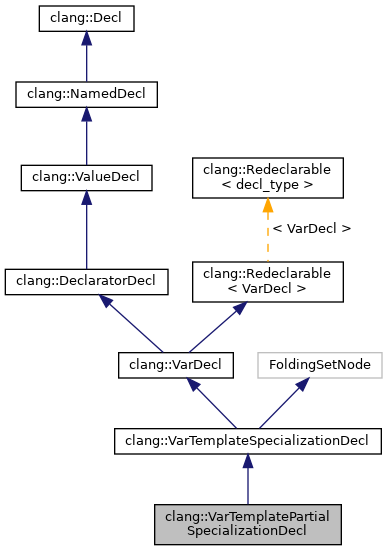 In this example, the instantiation of Outer<float>::Inner<int*> will end up instantiating the partial specialization Outer<float>::Inner<U*>, which itself was instantiated from the variable template partial specialization Outer<T>::Inner<U*>. Given Outer<float>::Inner<U*>, this function would return Outer<T>::Inner<U*>. Definition at line 2811 of file DeclTemplate.h. Referenced by clang::Sema::InstantiateVariableDefinition(), and clang::ASTDeclWriter::VisitVarTemplatePartialSpecializationDecl(). Definition at line 2775 of file DeclTemplate.h. Get the template arguments as written. Definition at line 2787 of file DeclTemplate.h. Referenced by clang::TemplateDeclInstantiator::InstantiateVarTemplatePartialSpecialization(), and clang::ASTDeclWriter::VisitVarTemplatePartialSpecializationDecl(). Definition at line 2782 of file DeclTemplate.h. Referenced by clang::Sema::DeduceTemplateArguments(), clang::TemplateDeclInstantiator::InstantiateVarTemplatePartialSpecialization(), clang::ASTDeclWriter::VisitVarTemplatePartialSpecializationDecl(), and clang::ASTNodeTraverser< Derived, NodeDelegateType >::VisitVarTemplatePartialSpecializationDecl(). Determines whether this variable template partial specialization was a specialization of a member partial specialization. In the following example, the member template partial specialization X<int>::Inner<T*> is a member specialization. Definition at line 2839 of file DeclTemplate.h. Definition at line 2818 of file DeclTemplate.h. Note that this member template is a specialization. Definition at line 2846 of file DeclTemplate.h. Definition at line 2762 of file DeclTemplate.h. Definition at line 2763 of file DeclTemplate.h.